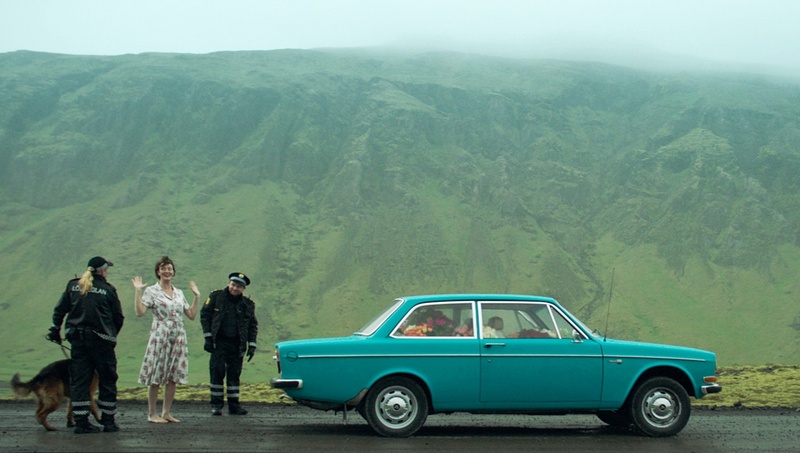 Writer/director Benedikt Erlingsson’s Woman at War opens with cinematography that thrusts the viewer into the natural beauty of Iceland. As the credits appear across the screen, we’re introduced to the woman in the title and revel in delight at the little band, producing the unconventional musical score right before our eyes. Erlingsson’s imagination marries entertainment with social and environmental issues in feature film in a way I’ve never seen before. His cinematic approach is reminiscent to the genius peculiarities of Edgar Wright, only with a dash of importance. Woman at War is wholly sarcastic, but you wouldn’t know that simply by reading the script. It’s the musical composition (and certainly how its featured), the editing, and Geirharðsdóttir performance that fill in those added bits of dark comedy. Organized sabotage the government is calling a recent slew of attacks on a local towns power lines. The intent behind the disturbances, which include blown up transformers and downed powerlines, is to slow or stop an aluminum factories deal with China, causing further damage to Iceland’s natural habitat. What the government and media don’t realize, is that the seemingly meek and genteel artistic choir director Halla (Geirharðsdóttir) is single handedly behind all of the power disruptions. Her extremely well planned intervention hits a snag when she’s notified that her four year old request to adopt has gone through and she will soon become a 49-year-old mother. Her twin sister Ása (also played by Geirharðsdóttir) reminds her of their mothers advice: “fond solutions”. Mountain Woman the media labels the culprit, as the city is divided on which side they fall on, peace or radicalism. Erlingsson’s imagination marries entertainment with social and environmental issues in feature film in a way I’ve never seen before. Editor David Alexander Corno pulls the audience in from the fist frames, utilizing all the technical elements his frequent collaborator Erlingsson has given. Just when you think you have seen the most clever moments Woman at War has to offer, you are surprised again and again. A minor haphazard might be how distracting the locations are from the plot of the story. There are simply not enough films shot outdoors in Iceland. Each time Halla gets backed into a corner, and you think, this is it, she’s caught, it’s over, the screenplay will again surprise you and ensure that the explanation is reasonable. There isn’t a dull moment in the swift 100 minute running time. The film appears meticulously groomed for errors, continuity issues and anything unnecessary that can be trimmed to make it flow better. I guess you would call what the musicians, who follow Halle to the tops of buildings, and on the edges of rushing water with the musical score, breaking the 4th wall, but it’s an ingenious and delightful gag. Erlingsson maintains his balancing act of entertainment and important subject matter until the closing credits, a rarity. His screenplay, co-written with Ólafur Egilsson is one of the most crafty I’ve come across this year. Woman at War is one of the most delightful entries in the 91st Annual Foreign Film race at the Academy Awards and second only to Alfonso Cuaron’s Roma, although it might have an easier time appealing to the mainstream. You won’t find a better hybrid of entertainment and social/environmental importance in the feature film category this year.